Hand i Pockets is a very inspiring way to engage people with dementia through their hands, craft, play and technology…. Hand i Pockets is a funshop that invites YOU to come along and make objects for fun and enjoyment to stimulate persons with dementia. 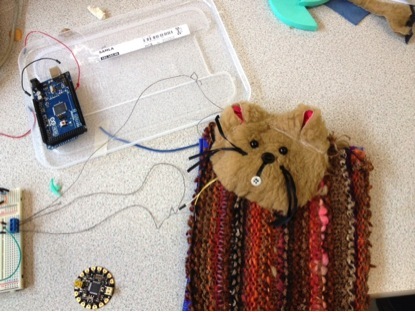 It involves playing with craft textiles, hacking toys and embedding electronics. Life can be increasingly limited for people with dementia – but everyone likes to have something to do, things to fiddle and play with or games to amuse. This funshop gives you a chance to contribute ideas for new activities for people with dementia. What stuff, would you like to play or fiddle with? What would make you laugh? What would you put in your pocket?